As one leaves the Pacific Ocean to veer from the Pacific Coast Highway to Highway 33 toward Ojai, the eyes catch sight of the sunlight over the hillside on the left. Sometimes just a glimmer of light, other times a bright shimmering over the fields and orchards of the old Taylor Ranch: a first sign on the road up to Ojai that something is quite different now after that turn. The 15 miles from the ocean waters to the mountain valley takes just twenty minutes to drive, but feels much longer. Time and distance can be measured, but the impression of entering another realm is a flexible reality. The stretch of highway through La Canada Larga runs a few miles. While you can already see the Topa Topa Mountains in the distance, famous for their occasional and unforgettable “pink moment,” the wide road seems to have purpose: a feast for the eye and a time to prepare for the entrance on to the more narrow, winding mountain road leading higher up to the Ojai Valley. “The essence of drawing is the line exploring space,” says Andy Goldsworthy, an artist who has deeply explored movement in art and nature. Driving up to Ojai on that road feels like a visual andante. That seductive sense remains still fresh and exciting after years traveling on the same path, first as a frequent visitor from Los Angeles, later as a full-time resident of the Valley. Seekers of art adventure take the road up to Ojai the second weekend in October. For some it’s an annual pilgrimage. Their destination: touring the open studios of the renowned Ojai Studio Artists (OSA). This year it takes place October 8-9. 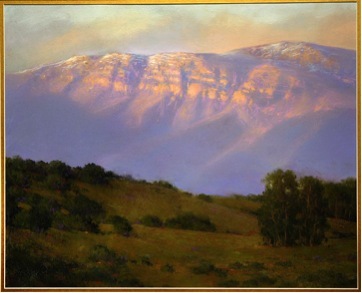 OSA’s website (www.ojaistudioartists.org) gives ample information about the organization, its founders and history, its 52 current members, this year’s tour, and the “Meet the Artists” reception at the Art Center. Yellow banners mark the location of the studios. Easy to spot! Open studio tours have become a favorite event in recent years, drawing both local crowds and tourists. There appear to be at least 26 of them in Southern California alone! Visitors always get a map and guidance to the studios. The tours usually are run by the artists themselves. They open their homes/studios for visitors to see their work (both completed and in-progress) and to engage in conversation. So there is a chance to really connect with an artist, in their real-life personal environment (gardens, dogs, chickens and all), not in the more neutral/abstract/detached space of an art gallery or cultural organization, nor with the frenetic pace and accelerated intensity of busy booths at big art fairs. Most art lovers treasure this chance at an up-close and personal glimpse into an artist’s creative heart and soul. The OSA Tour was founded in 1984 by Marta Nelson, Gayel Childress and Bert Collins. It was called “A Day in Art Country,” a clear homage to the French Impressionists and their love of landscape painting. Every year OSA organizes an exhibit and sale at the Ojai Art Center showcasing works by all their artist members, whether or not they participate in the tour that year. How is the Ojai Studio Artists Tour different from others? In 1989, Vivika Heino and Linda Taylor joined the three original founders to initiate a new program: Revenues from the tour would fund scholarships to help local students with their continuing education in the arts. Members also agreed to participate in some way with art enrichment for their community and schools. Since 1993, OSA has given out more than $133,000 in art scholarships. In the process, these artists have changed a few lives. Art does that. You have to leave the coastline and drive up the gentle hills to a higher place to reach this small paradise called Ojai. The light is different here. There is a sweetness in the air. That drive itself on a fairly narrow mountain road towards the village creates excitement and expectation: a sense of initiation emerges, inspiring those seeking a closeness to the artist’s life to deepen the connection to their own creative life force. The mystery of art is contagious. And that surely is a good thing. Previous post: Art and About… of Dogs and Their Artists.